For this 2016 Special Release, annually limited edition, Brora declines into an old 38 year old expression, distilled in 1977 and bottled in 2016. For this 2016 Special Release, annually limited edition, Brora declines into an old 38 year old expression, distilled in 1977 and bottled in 2016. 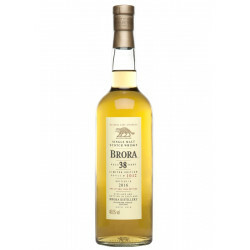 This exceptional rugged and peated Single Malt, has an attractive ocean breez smell but maintains the Brara distillery's character, with more smoke, ashes and peat. A little bit of water highlights a nice mellow taste with this 48.6° whisky. Only 2984 bottles available world-wide. 1 950,00 € tax incl. Discover the Brora distillery from the Highlands! The founder of the Brora distillery (formerly called Clynelish) was the Marquis of Stafford, a formidable and inspired businessman. He make his barley stocks profitable, his opened a distillery and starts selling whisky in 1824. The distillery is bought in 1896 by the James Ainslie & Co group that resells some of its share to the DLC (Distillers Company Ltd) in 1912. In 1967, a semi-detached distillery called Clynelish is built. The old distillery is closed and reopened in 1975 under the Brora name, and definitely closed in 1983. Brora used to produced the most peated Single Malt of the Highlands, and was nicknamed by some aficionados the “Lagavulin of the North”.